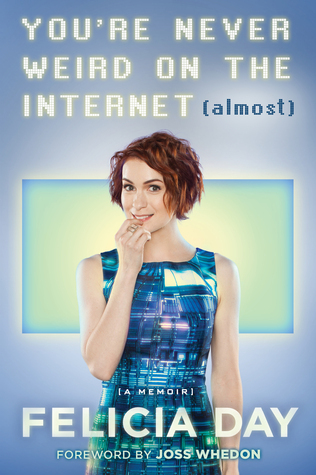 I was only peripherally aware of Felicia Day before starting this book so why read it? Well, it was a daily deal on Audible and it is about geeky stuff, so I gave it a try. I'm glad I did. I have watched all episodes of Buffy the Vampire Slayer, so I must have seen her there, but I don't remember. I saw her on Dr. Horrible's Sing-Along Blog and remember hearing that she was some kind of geek icon, but had no idea why. Now I know and I see why she's popular with geeks. This woman is a talented powerhouse who thinks of herself as a neurotic mess. She's the epitome of the nerdy protagonist from the kind of books I love best. She's brilliant (she got a nearly perfect score on the SATs with only one week of study and a terrible homeschool education), talented (she's a violin prodigy), and loves all of the stuff nerds do. Did I mention that she's also a main stream actress with recurring roles on Supernatural and Eureka? That's on top of the web show that made her internet famous, The Guild. I'm not a genius and I have no special talents, but I could relate to her World of Warcraft story, I never played WoW because I learned my lesson long before that when I played a text-only mud (multi-user dungeon) in the early days of AOL. Where Felicia Day played 8-12 hours a day, I was playing a minimum of 12 hours a day and more than once played for 2 to 3 days without stopping. Seriously, no nap, no meals, no stopping. Yes, I was an addict. Unfortunately, I didn't leave the game and become an internet celebrity, I just went off and learned how to be a web developer instead, but I could relate to the struggle to fill the time after the game ended. Of special interest was the chapter on Gamer Gate. This was another thing I hadn't paid much attention to, but knew it was about the misogynist underbelly of gaming culture. To be honest, I don't get it. Why do some men think that they own video games? I have been playing longer than most of these idiots have been alive. How dare they come along and try to co-opt my experience. I am glad she stood up to them and am disgusted by the fallout. It makes me glad I'm not even internet famous. Back to the book. It's entertaining, witty, and worth the read if you have any interest at all in geeky things. Five stars from my half-elf heart.